The four leaf clover symbol was adopted by Alfa Romeo almost 85 years ago after team driver Ugo Sivocci painted one on his car before winning Sicily’s gruelling Targa Florio race in 1923. The lucky quadrifoglio subsequently came to symbolise Alfa’s high-performance models – and if you owned one of the late 20th century versions you might agree that a certain amount of luck was required simply to boost the chances of making it home without a breakdown. Thankfully things have changed a bit since then, and Alfa’s reputation for building unreliable cars is no longer justified – although its well deserved reputation for building lovely looking ones prevails, as evinced by the new Giulia saloon which brings a pleasing injection of Italian flair to a sector of the market hitherto dominated by Teutonic sameness. 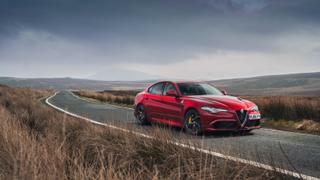 And luckily for lovers of ridiculously rapid four door cars, the Giulia range is topped by the gorgeous and fabulously fast Quadrifoglio, which has appeared from nowhere to threaten similar super-saloons such as the BMW M5 and Mercedes-AMG C63. And if you never imagined an Italian car could mix with such established and meticulously engineered weaponry, think again. 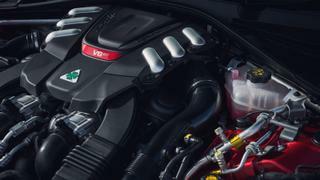 The Giulia Quadrifoglio not only looks great, it also feels beautifully put together – and beneath the bonnet lurks a 2.9 litre, V6 engine with twin turbochargers worthy of the best new supercars. While the Alfa gives away 1.5 litres to the BMW and one litre to the AMG in terms of capacity, it still produces a hefty 503hp, which is sufficient to propel the car to more than 190mph. It accelerates like a rocket, too – and, despite being relatively large, is as nimble as you like thanks to the weight-saving use of carbon fibre for the bonnet, roof and propshaft and aluminium for the doors. Rear wheel drive, even weight distribution and quick steering also help, and the now-usual switch for selecting different driving modes means you can choose between a range of rides. Downsides? Road noise can be intrusive and the automatic, paddle-shift gearbox somewhat blunts the car’s character. But the good news is that a six-speed manual transmission is available in several markets.